I recently came across a SharePoint site that wouldn’t load. Received the following error when visiting with the SharePoint Team site, Central Admin page, etc. I reset IIS which didn’t help. Confirmed the SharePoint sites were started but after checking the Application Pools, noted that they were both stopped. Went ahead and started both but immediately found they had stopped again. After looking into the IIS App Logs, noted the following error: Application pool SecurityTokenServiceApplicationPool has been disabled. 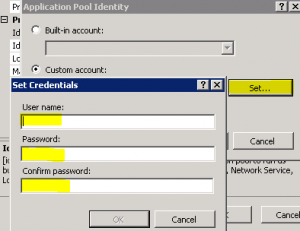 Windows Process Activation Service (WAS) encountered a failure when it started a worker process to serve the application pool. There was recently a password change on the service account utilized for the SharePoint service. 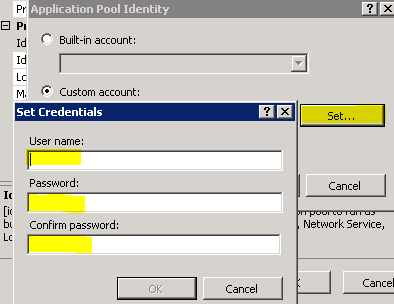 While the Windows services were up and running the App Pool identity needed to be updated. The fix for this is to go to the Advanced properties of the App Pool, either by right-clicking on the App Pool of from the Application Pool Tasks on the task pane. Under “Identity” select the ellipsis to the right, and “Set” under custom account and enter your new account or updated password details. Once updated, your should now be able to start your App Pool and have it stay running! 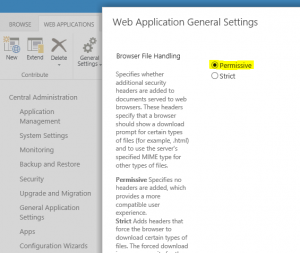 When browsing in Internet Explorer to a SharePoint 2013 site, by default the only option for uploaded PDFs is to “Save.” In order to give you the options to open different file types from the SharePoint site you will need to adjust Browser File Handling to “Permissive” instead of the Default “Strict” setting. 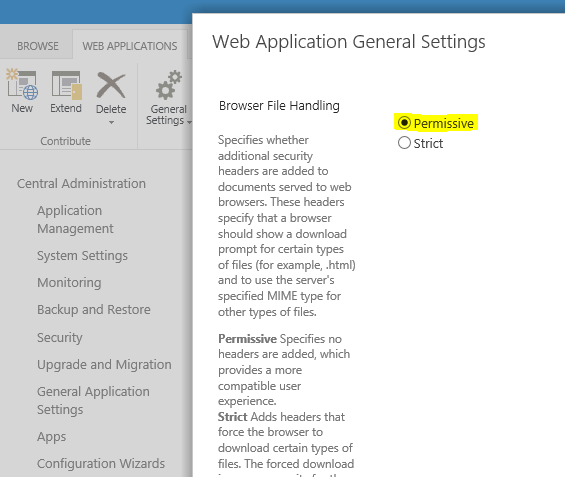 Browse to your SharePoint Central Admin Site, under Application Management select “Manage web applications.” From here, select each of your sites, select General Settings on the Web Applications Ribbon & set Browser File Handling to “Permissive.” You should now be able to open PDF documents from your SharePoint site. We have recently deployed a SharePoint 2013 Enterprise rollout for a customer. After a period of inactivity, server restart or IISRESET the first time the various sites were browsed there was a noticeable (10sec+) lag in displaying the page. After some research it appears that this is a common SharePoint/IIS issue due to IIS Applications recycling their worker processes. The work around for this is a warmup script which will navigate to the various pages and “warm them up.” This can be used either by a) Simply running the script (remembering to run Set-ExecutionPolicy first) or b) By running SPBestWarmUp.ps1 -install which will install it as a scheduled task to run every hour.